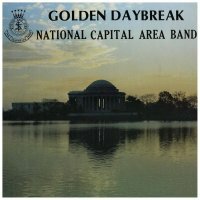 The first recording released by the band (then known as the National Capital Area Band), conducted by A. Campbell Robinson. LP only, recorded in 1978 at the Prince George’s Corps in Maryland. As has become a tradition with the band’s recordings, the album featured a number of previously unrecorded or under-recorded items. Seven of the ten items are by composers who were members of the band, and only four of the ten items had previously been published. An interesting fact about this recording is that the company that pressed the discs applied the labels to the wrong sides, so that the side labeled Side One is actually Side Two.